Post-natal health ward, Aga Khan Medical Centre, Gilgit, Pakistan. The Aga Khan University Hospital in Karachi, Pakistan. 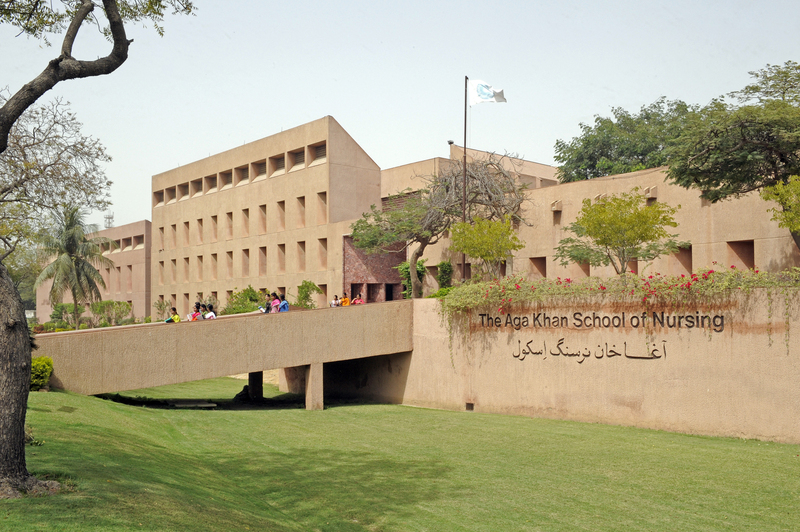 The Aga Khan School of Nursing in Karachi, Pakistan. AKU's Community Health Services, working with the Governments of Pakistan and of Sindh province, as well as NGOs, has cut malnutrition in half in some of the poorest districts of the country. 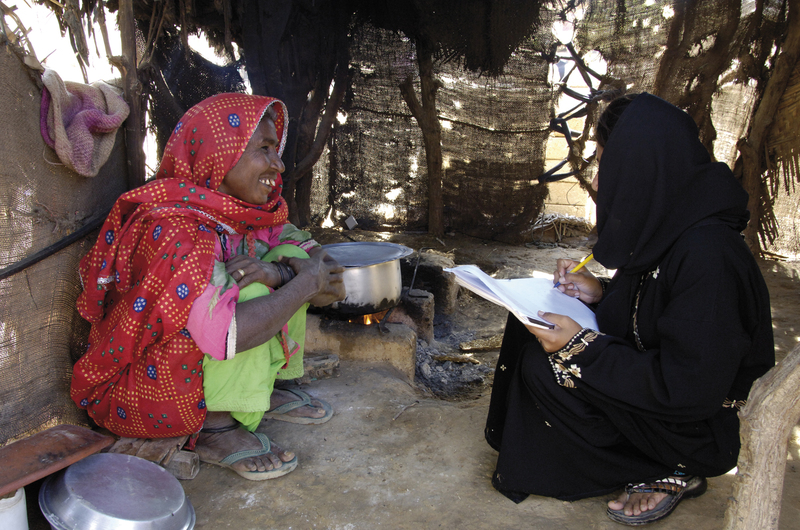 Aga Khan University’s Department of Community Health Sciences, which provides critical health and socio-economic support to the squatter settlements of Karachi, received the 2009 MacJannet Prize for Global Citizenship. 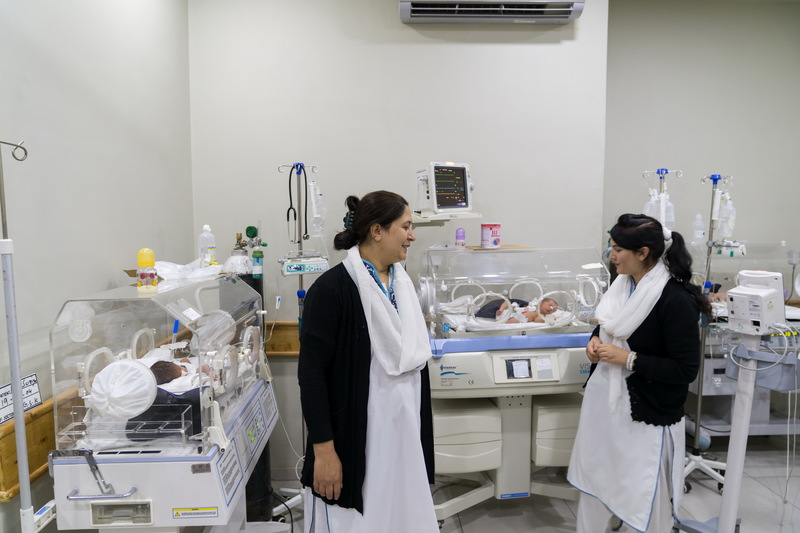 AKDN's health activities in Pakistan range from community level health centres operated by the Aga Khan Health Services to the Aga Khan University Hospital, Pakistan's leading tertiary hospital. AKDN operates over 450 health clinics across the country, five secondary hospitals in Karachi, Hyderabad and Gilgit, and the Aga Khan University Hospital in Karachi. In addition, the Aga Khan Foundation works with local governments to support a number of health related initiatives to improve access to basic health care. O Centro Médico Aga Khan, em Gilgit, Paquistão, foi inaugurado em 2016. The first health institution built in Pakistan was a 42-bed maternity hospital - formerly known as the Janbai Maternity Home - opened in Karachi in 1924. Today, while maintaining that early focus on maternal and child health, Aga Khan Health Service, Pakistan (AKHS,P) also offers services that range from primary health care to diagnostic services and curative care. It reaches over 1.1 million people in rural and urban Sindh, Punjab as well as Gilgit-Baltistan and Chitral. As the largest not-for-profit private health care system in Pakistan, its goal is to supplement the Government's efforts in health care provision, especially in the areas of maternal and child health and primary health care. In the North of Pakistan, AKHS,P has been implementing the Northern Pakistan Primary Health Care Programme since 1987. Working in partnership with local communities, the government, and other AKDN institutions, like the Aga Khan Rural Support Programme, the goal has been to find sustainable ways of financing and delivering primary health care in the high-mountain valleys. This has led to a village-based approach -- the designation of community health workers by the local village organisation, the training of these workers in community-based disease prevention, and the reorientation of health professionals (government and private) to primary health care. Since it began, AKHS,P has trained over 1000 Community Health Workers in Gilgit-Baltistan and Chitral. AKHS,P manages in Gilgit-Baltistan and Chitral (GBC) 57 Basic Health Centres (BHCs), seven Comprehensive Health Centres (CHCs) of 10 to 30 beds, and the 50-bed Gilgit Medical Centre. Four of these CHCs are run via public-private partnerships (PPPs) agreements with government. These assets cover around 600,000 people. implement and contribute to global standards in health and health care through working closer with the Aga Khan University (AKU) and other partners in training and operations research. Through this and related programmes, AKHS,P has been working to promote a new orientation of health services in Pakistan towards primary health care. Close collaboration with the Aga Khan Foundation (AKF) and AKU has been the cornerstone of this endeavour. The three institutions are also collaborating in a drive to build health systems linking preventive and curative care efforts, as well as the different levels in the AKHS,P system, from the village health centre to the Aga Khan University Hospital in Karachi. The Aga Khan University School of Nursing and Midwifery in Karachi, Pakistan. The Aga Khan University (AKU), founded in 1983, educates health care professionals, generates knowledge pertinent to Pakistan and the developing world, and provides world-class health care at its hospitals and clinics. 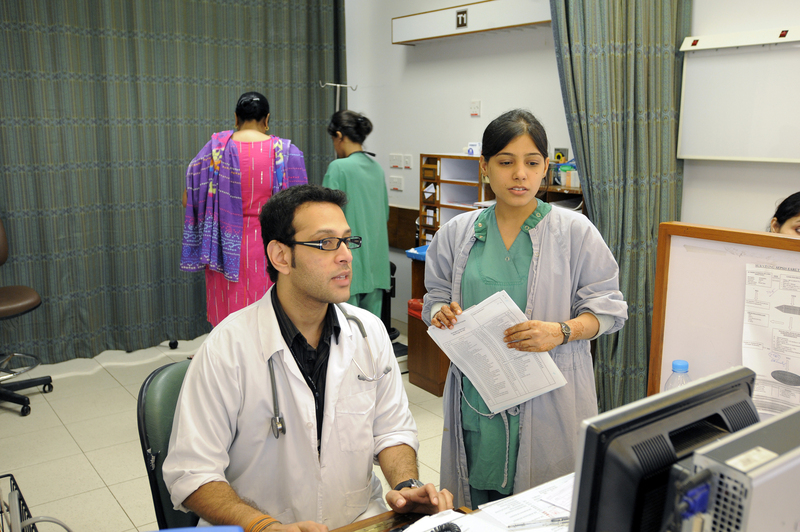 At the heart of AKU is the 710-bed Aga Khan University Hospital, Karachi, which became Pakistan’s first hospital to meet the rigorous accreditation standards of the U.S.-based Joint Commission International in 2006, and which operates the country’s only clinical laboratory accredited by the College of American Pathologists. The Hospital is the main teaching site for AKU’s Faculty of Health Sciences, which includes a Medical College and a School of Nursing and Midwifery. AKU alumni have gone on to study, teach and research at the world’s most prestigious universities, and to play leading roles in improving health in Pakistan. Seven of Pakistan’s top 10 health researchers are AKU faculty, according to an analysis by the Pakistan Council for Science and Technology. AKU also operates four woman and child hospitals with a total of 213 beds, as well as 264 outreach medical centres in more than 100 cities across the country. In 2017, the University health system treated nearly 1.4 million patients. To date, AKU’s Patient Welfare programme has provided 2.4 million low-income patients with reduced-cost care worth more than $136 million. Community midwife examining a baby in Chitral Child Survival programme. The Aga Khan Foundation (AKF) in Pakistan has been working with local governments in Pakistan to help improve access to health care to those who may not be able to otherwise afford it. These initiatives have included training community midwives to make health care geographically more accessible and introducing micro health insurance to make health care financially more accessible. Community Midwives: Under the aegis of Chitral Child Survival Programme, and in collaboration with Department of Health in Khyber Pakhtunkhwa province, 28 community midwives were trained, deployed and later supervised to help increase the percentage of assisted deliveries in Chitral. This initiative has been a great success and has been much appreciated by the local and provincial government, especially as these community midwives are now regular employees in the government’s MNCH programme. Micro Health Insurance: Following a highly competitive process, a joint effort by the Aga Khan Foundation, the Aga Khan Rural Support Programme, the Aga Khan Health Services (AKHS) and Jubilee Life Insurance was awarded a social protection project entitled Micro Health Insurance Initiative. With the support of the German government's development bank kfW and the Government of Gilgit Baltistan, the initiative will use data acquired from the Benazir Income Support programme to identify the poorest 21% of the Gilgit district whose insurance premiums will be paid by the government. These poor families covered under the Micro Health Initiative will have access to cash-less health services at the government, AKHS as well as the private hospitals in Gilgit. The aim is to protect these families from the escalating cost of health incurred by chronic illnesses, maternity, and injuries due to road traffic accidents. Public Private Partnerships: AKDN has demonstrated successful models of public private partnerships in managing secondary level health facilities of the government in Chitral as well as Giglit Baltistan (supported by the Italian, Norwegian, German and Canadian governments). Such partnerships not only build capacity of the public sector and enhance the trust among community served by these hospitals, but also have complemented the government’s agenda of providing equitable quality health care to the people of the region. The Central Asia Health Systems Strengthening project, funded by Global Affairs Canada, has provided state of the art diagnostic equipment, supplies, training, and e-health services to all the project facilities. Cross Border Health Initiative: With support from the French government, AKDN has been implementing cross border Maternal Newborn Child Health activities including nutrition, immunisation, family planning and reproductive health care to people living close to the border between Pakistan and Afghanistan. This project has been part of Pak-Afghan-Tajikistan cross border health initiative helping people living in remote communities to access healthcare at the health posts established at the border villages of Chitral.